About 300 people employed in Chonburi’s tourism industry were invited to attend a workshop next week in Pattaya to improve their hospitality skills and safety training. Chonburi Permanent Secretary Chawalit Saeng-Uthai presided over the Dec. 4 planning meeting for the Dec. 16-17 training seminar at the A-One Royal Cruise Hotel. He said the workshop was organized to raise awareness about ways companies can improve their service to tourists and raise the city’s international tourism reputation. 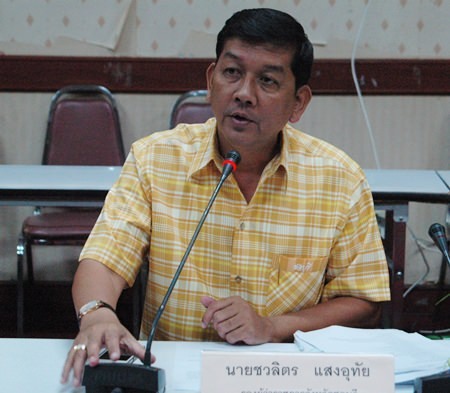 Chonburi Permanent Secretary Chawalit Saeng-Uthai presides over a planning meeting to improve the tourism industry’s hospitality and safety skills. The Royal Thai Navy, Pattaya police and other agencies are expected to participate in the workshop, which will provide practical and theoretical activities to develop tourism personnel. Attendees also will be educated on public-safety and image campaigns, as well as learn the basics of marine rescue in case of boating accidents in local waters.